NITI Aayog has recently drawn an exhaustive plan for achieving the target of doubling farmers’ income by 2022-23 through a seven-point strategy. The government proclaims to give emphasis on raising farmers’ income rather than increasing the agriculture output (Press Trust of India, 2017). The contribution of agriculture to GDP was only 17 per cent, while 45 per cent of the population was engaged in agriculture (Ministry of Statistics and Programme Implementation, 2017). The contribution has to be increased to 45 per cent for which skill development programmes have been started to provide training and employment to people near their homes, according to Ramesh Chand, Member, NITI Aayog (Press Trust of India, 2017). Small farmers practice agriculture despite the high risks of crop failure and/or low market prices. NITI’s ambition of increasing the GDP contribution from agriculture to 45% – a number without any rationale shared – is an arbitrary statement without any backing as to how this will be achieved and how will it benefit the farmers. Most of the raw produce for industries comes from agriculture. A GDP target of 45% cannot be achieved by merely increasing agriculture productivity. This either means food inflation or radical change in land use pattern. Experience from other countries (Bhamra, 2015) shows that the trend of percentage of GDP contribution from agriculture has been quite the opposite over time, GDP contribution from agriculture has reduced as more and more value addition occurs in the industries, especially in fast moving consumer goods. What is important to note is that increasing incomes of the farmers may not necessarily reflect in the GDP contribution from agriculture. Increase in income of the farmers from value additions at local level in farmer producer companies will increase income of the farmer members but the GDP contribution from the business will be added to industries. While the government is continuously announcing initiatives (digital wallet, smart phone apps, crop insurance, soil health card), waivers for farmers, and there are debates over target definitions and setting; the cases of farmers’ agitations across the country continue to be reported in high number. Farmers from Madhya Pradesh and Maharashtra recently protested when they found no buyers for their bumper crop. Declining output value is identified as the root of a farmer’s sorrow. Between 2011-12 and 2015-16, the total value of cereals and pulses produced in the country went down by 3%, for oil seeds by over 13% and sugar by 1%, according to National Accounts Statistics, 2017. Output values are declining because the cost of what the farmers put in seeds, fertilisers, water is rising faster than the prices they get by selling (Verma, 2017). 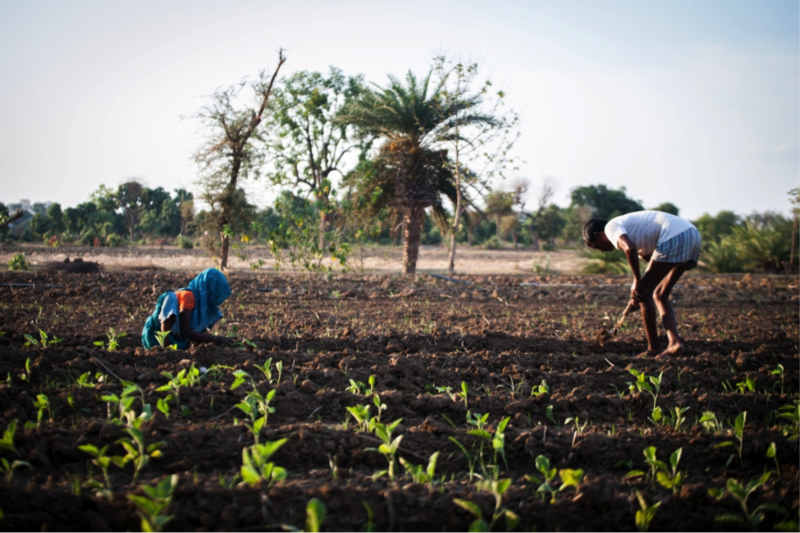 While the vision of doubling farmers’ income takes farmers as one homogenous set, the small holder farmers – with land less than two hectares – around 85% of the total farmers are the most vulnerable population amongst farmers. There is a gap between what the Government aspires to achieve and what is actually being translated in impact on the ground. An important question to ask in this context is – whether we see farmers as entrepreneurs, and agriculture as business and how can we increase the performance of this business. Agriculture cannot merely focus on cost minimization and profit maximization for the produce. Use of fertilisers, seeds or other agri-models (mono-cropping) may increase the land productivity and therefore maximize profit margins. But if these choices worsen water balance in the region or degrade soil health or deprive soil of a particular nutrient – it will worsen the food security of the people today and in the future. Therefore, only increasing productivity and profit in short run does not work in agriculture sector. Unlike a usual businessperson, farmers buy in retail and sell in wholesale markets. Farmers are the only business persons who are buying inputs like seeds and fertilisers at MRP from retail outlets but selling their produce in somewhat prefect markets – many buyers, many sellers. In a usual mandi, buyers are still unionized and transport and information gaps enable the buyers to decide the selling price of the produce, limiting the choice of sellers (farmers). Farmers usually face high production risks than a usual business. 60% of the land is rain-fed agriculture in India – with constraints on natural resource availability – suitable water, land and soil conditions. The production risk is further aggravated with the changing climate resulting in crop failures or reduced crop production. Eleven States declared drought between August 2015 and April 2016 (Sen&Bera, 2016). Regional water availability for food production is expected to further reduce due to impacts of climate change like rising temperatures, changing precipitation patterns and increasing frequency of extreme weather events (Ranuzzi, 2012). Farmers act more as mere managers of the produce; the production is heavily dependent on external factors not under his control – environment. Farmers Producers Companies (FPCs) is an innovation that can put the above three typical cases in favor of the farmers and make a good business case for practicing economically remunerative, and ecologically sustainable small-scale agriculture. The Government of India had a target of setting up 2000 FPCs, covering 2.5 Lakh farmers by 2015. There are already more than 3000 FPCs that have been registered. However, a recent study by the Institute of Livelihood Research and Training found that many of these FPCs are missing both competent, business-minded leadership and transparency (Mokkapati, 2017). Farmer Producer Companies have to be prevented from becoming another middleman, merely a more honest one when it provides cheaper inputs (because of buying in whole sale). While MRPs and cheaper inputs due to wholesale buying is surely a slight relief to the farmer, it misses the comprehensive framework of reducing costs and increasing productivity of the farmer members. Farmer Producers Companies cannot achieve their objective till they work on the entire value chain. Merely providing agri-inputs without connecting farmer members reliably to the market is not enough. Similarly, only selling the final produce for business – from member/non-member farmers may be good for FPCs but may not necessarily benefit the farmer members as they may earn dividends but not necessarily earn from directly business with the FPC. For efficient and optimum utilisation of assets, an FPO, like any other business needs to identify products and services across the year and one crop production cycle is not enough, both from the point of of businesses and sustainability in agricultural practices. The choice of crop and the agricultural practice needs to be conducive to the agro-climatic conditions of the region. Value addition is not just important for real income benefits to the farmer members. There are only limited benefits that can occur by removing the middle-men. The real potential of enhancing farmers’ income is in adding value at the local and decentralised level. Selling raw ground nut and ground nut oil has a difference of more than 5 times in its selling price, as shared by one of the Farmer Producer Company in Anantapur – Dharani Farmers’ Collective. Financial turnover as the sole performance indicator is too narrow. FPOs’ business cannot be evaluated by the amount of profits it gives as profit dividends to its shareholders. 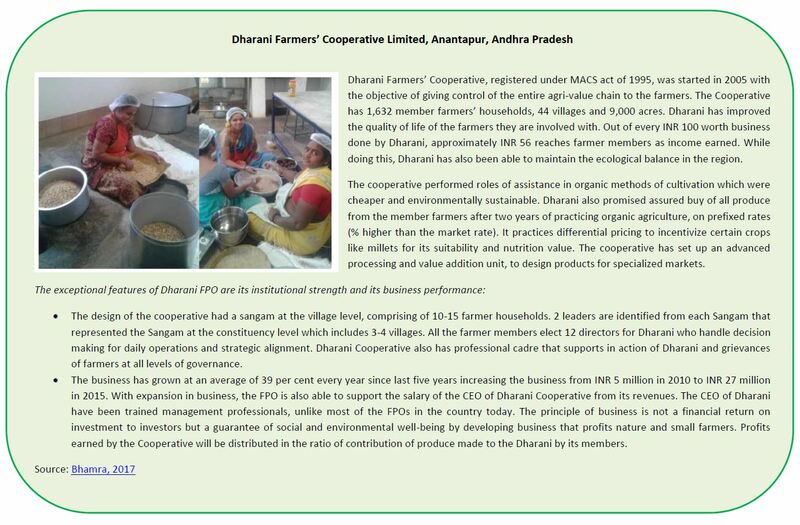 One of the possible parameters of performance measurements could be total enhancement of income of farmer members per INR 100 Rupee of business done by the FPO. Amul tracks its progress on a similar parameter where for every INR 100 business that Amul does, the farmer member earns approximately INR 63. The Government of India needs to focus on how the strengthen FPCs such that they perform the objective of enhancing income of small farmers through sustainable agriculture; strong marketing and value addition channel. This demands serious interventions to address the management constraints, financial credit constraints and market creation that FPCs would require support in. Isolated schemes for agriculture production and market connection will never allow small farmers to mature in utilizing the business opportunity and continue to depend on loan waivers. The views expressed in the article are those of the authors’ and not necessarily those of Development Alternatives. Bhamra, A. (2015, December). What can Indian Agriculture Systems learn from other countries? Development Alternatives Newsletter. Mokkapati, S. R. (2017, June 9). Three crucial stumbling blocks in farming. Hindu Business Line. Press Trust of India. (2017, June 24). NITI charts doubling farmers’ income strategy, lauds HP. Times of India. Ravi, A. (2017, June). Is Indian farmer being pushed out of agriculture sector? One India. Verma, S. (2017, June 25). From farmers today, grass is greener than rice and pulses. Times of India .